The giant weta is one of the biggest insects on Earth, easily dwarfing most bugs and even some small rodents. Here are 10 facts you probably don't know about this New Zealand native. 1. It can outweigh a mouse. The giant weta is the world’s heaviest reported insect. It can weigh up to 2.5 ounces, though many weta don’t reach quite that giant of proportions. You can watch one face off with a cat above. In 2011, Smithsonian researcher Mark Moffett stumbled upon a particularly large giant weta on a trip to New Zealand’s Little Barrier Island. An image of Moffett feeding the huge insect a carrot went viral. A New Zealand insect expert later noted to the New Zealand Herald that feeding the insects carrots is quite common. 4. It has dozens of weta cousins. There are over 70 species of weta in New Zealand. The giant weta’s close relatives include the carnivorous tusked weta, the tree weta, and the cave weta. Alpine weta can freeze solid during the winter, thawing out and going on their way once spring comes. 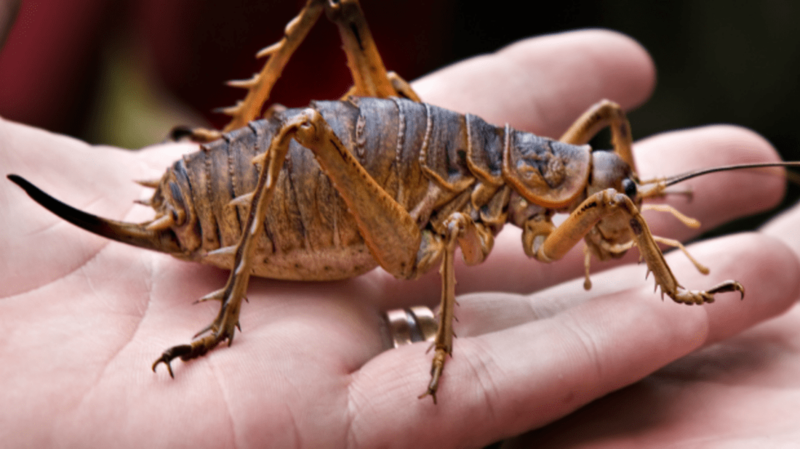 Though it looks like a big cricket, giant weta are too heavy to fly. Some of its relatives, like the tree weta, are more agile and can jump, but giant weta are decidedly earth-bound. 6. It’s close to extinction thanks to rats. When humans arrived in New Zealand hundreds of years ago, they inadvertently brought weta predators along with them, like rats and cats, which ate the insects. First described in 1842, the giant weta was considered extinct on mainland New Zealand by the 1960s, though they were once populous across the northern island. Giant weta are now considered limited to Little Barrier Island, about 50 miles northeast of Auckland. 7. It’s bred in captivity. Several conservation groups have begun breeding giant weta in captivity to increase the species’ numbers. So many baby wetapunga hatched at the Auckland Zoo in 2013 that the zoo had to take on more staffers to feed them all. In May 2014, the zoo released 150 giant weta on the island of Tiritiri Matangi. 8. It breathes through its exoskeleton. Like other insects, the weta doesn’t have lungs; it breathes through its exoskeleton. Holes in the weta’s exterior shell connect to tubes that pump oxygen to every cell in the insect’s body. 9. It has ears on its knees. The holes that serve as weta ears are located just below the knee joint on the front legs. 10. It’s older than some dinosaurs. Fossils found from the Triassic period 190 million years ago show striking similarities to the weta that inhabit New Zealand today.